There are many benefits to owning an AR-15, but one of the biggest is that it’s a highly modular firearm that can be customized to be exactly how you want it. One of the most replaceable components of the AR-15 as well is the charging handle, though it’s also one of the most overlooked customizable parts as people tend to instead focus on the furniture, trigger, and barrel. But since the charging handle serves as a vitally important role in the overall function of the AR-15, it simply cannot be ignored. 2 What’s Wrong With Using The Mil-Spec Charging Handle? 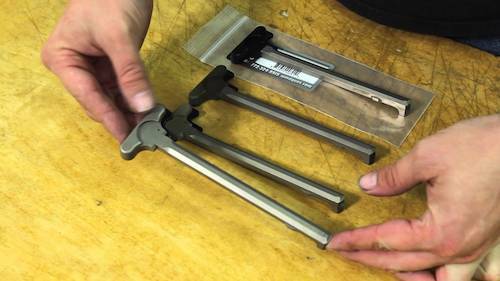 3 What Do You Need In A Charging Handle? The charging handle is simply the component of the AR-15 that moves the bolt into the ‘ready’ position so the rifle can be fired. It also allows you to eject spent shells, to clear a stoppage, and to confirm that the weapon is either empty or loaded. 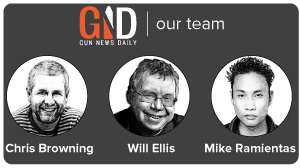 Needless to say, an AR-15 simply would not be able to function correctly without one. The AR-15 is also not the only firearm with a charging handle; far from it. Practically all other semi-automatic rifles have charging handles as well. In the case of rifles such as the AK-47 or Ruger Mini-14, however, the charging handle is located on the right hand side of the weapon. For the AR-15, it’s located on the rear of the receiver, and is more unique in that regard. What’s Wrong With Using The Mil-Spec Charging Handle? What’s wrong with using the mil-spec charging handle that already comes installed on your AR-15 when you buy it? In short, nothing. A basic mil-spec charging handle is more than sufficient for the needs of most civilians. If you’re someone who just likes to casually target shoot once in a while, a mil-spec charging handle will work just fine. That being said, if you’re someone who shoots more often (as in you shoot regularly) and you also engage in tactical training and what not repeatedly to the point that your AR is constantly being abused in adverse environments, then upgrading to a more durable charging handle is something you should seriously consider. 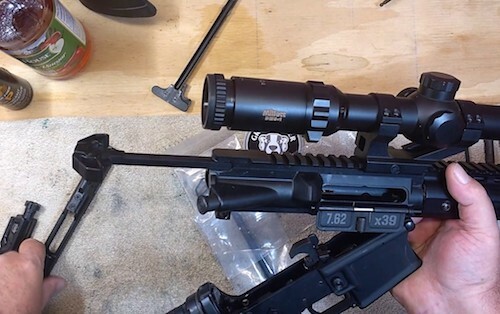 Furthermore, if you’re a lefty, it can be very awkward to use a right handed charging handle, especially if you have an optic mounted to the top of the weapon. What Do You Need In A Charging Handle? Basically, you need a charging handle that works! And almost all AR-15s come with mil-spec charging handles that do work. As was noted above, the only times you really need to replace your charging handle is A. If you need a more durable model for constant shooting scenarios in adverse conditions, and B. If you need a left handed or ambidextrous charging handle. An ambidextrous charging handle in particular would be highly versatile, and it is often preferred even by right handed tactical operators for this very reason so they can become proficient with either hand. An alternative would be an extended charging handle, with a larger latch to make it easier for the shooter to engage with a gloved hand. Meanwhile, if you need a more durable charging handle, then you can get one that is made out of heavy duty steel over aluminum. 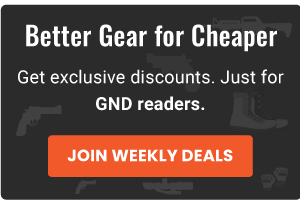 You may have heard of Bravo Company before; they make AR-15s of their own, and have developed a truly astounding reputation. 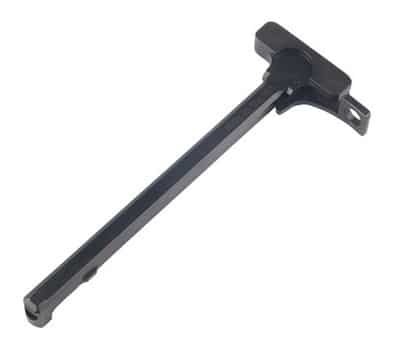 The BCM Gunfighter charging handle that they offer is built out of a heavy duty and high quality T6 aluminum that has been further finished with a hard coat anodized finish for superior rust and corrosion resistance in contrast to many standard mil-spec charging handles that come installed on AR-15s these days. It’s also slightly larger than other charging handles on the market so shooters wearing gloved hands will be able to get a better grip over the handle as well. 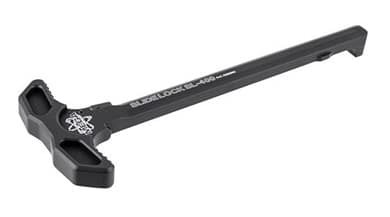 The Mega AR-15 Slide Lock Charging Handle is truly unique in the AR-15 world because it is a completely ‘latchless’ design, meaning that the charging handle does not have a latch so it’s a fully ambidextrous design. The reason this charging handle lacks a latch is so the number of moving parts is reduced, which reduces the odds of a breakage. Furthermore, there’s no button or lever that you need to depress either. Instead, you just grab onto the charging handle and pull it back to chamber or load your AR-15. At the very least, this makes things simpler to operate. And to ensure that the charging handle remains in place and does not pull back on its own, a strong spring pressure keeps everything in place. Are you looking to buy the most durable charging handle on the market, one that stand up to the worst kind of abuse and still work? If so, your answer is the Power Custom AR-15 Charging Handle. 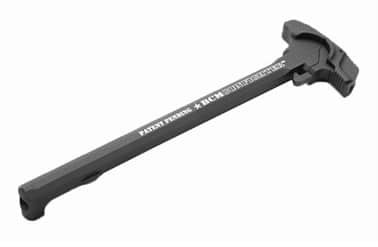 This charging handle is built out of steel instead of the forged aluminum that most other charging handles comes with. Other than that, it’s basically the same type of handle as as any other on the market, only with much improved durability for rough environments and conditions. 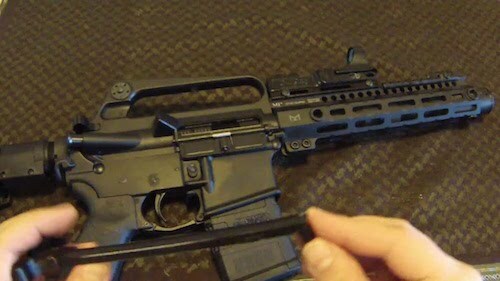 Again, upgrading your charging handle is not truly necessary in all cases because the handle that comes installed on your AR-15 out of the box should work just fine. The only exceptions to this rule is if you need a charging handle that’s more durable than normal or if you want one that’s ambidextrous for both right and left handed operation. In those cases, the three charging handles we’ve covered here today will serve you well. If you’re interested in finding the best AR15 scope on the market read our retailed guide.